No news today, but an informal survey: When booking award tickets with Aeroplan, Air Miles, British Airways, or any other program that may add carrier surcharges do you take into account time and connection considerations? That is what is the time vs. money correlation for you? For example do you book a direct flight to Europe and incur $600 or more in surcharges but get there in 8 hours or do you book via the U.S. or other countries and have multiple connections with perhaps 12 hours or more of travel so you only pay $150 in surcharges? We'd love to hear what you do and where you draw the line between money and time. Please comment below! Its Wednesday! So that means KLM's Wild on Wednesday is here. This week the offer is for flights from Canada to Sofia. 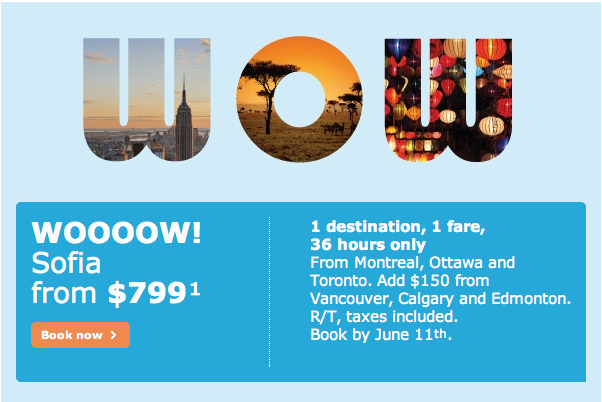 $799 all in from Eastern Canada or $949 from Western Canada Book by June 11th for travel between October 16th and December 10th. Find out more here.